So what is hosted VoIP? Well, it stands for Voice Over Internet Protocol, which is essentially the transmission of voice over the internet using IP packets. It enables businesses to optimise their telephony systems, realising genuine cost savings by using the internet instead of the traditional telephone network to route their calls. Movoda Horizon hosted telephony solution gives customers an alternative to the traditional PBX telephone system, offering the scalability and flexibility they need to control their telecom estate as their business requirements change. 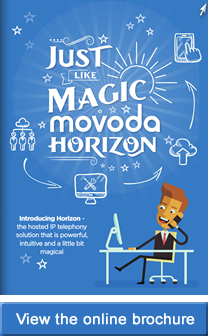 Movoda Horizon provides a feature-rich and fully functioning telephony system that can be deployed using physical IP handsets or delivered over a softphone application running on your PC or smartphone. With comprehensive business continuity options and built in disaster recovery as standard, the hosted system gives you a cost effective and low-risk solution perfectly suited for the small to medium enterprise market. Movoda Horizon VoIP solutions offer your business greater flexibility with additional features and significantly reduced costs. To explore all the features and benefits of the Movoda Horizon hosted telephony solutions, please take a sneak peek at the online brochure detailed on this page.